Rigid doorstop protects interior walls from impact damage by shielding contact point of wall and door knob. Repairs damaged walls. Adhesive-backed wall doorstop for use on clean, smooth, flat surfaces only. Non-marring rubber, concave design permits knob to strike stop without damaging or engaging lock mechanism. Polybagged. 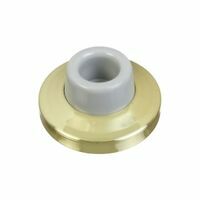 Paintable circular disk used to protect surfaces from door knob damage or cover existing damage. Paintable circular disk used to protect surfaces from door knob damage or cover existing damage. With plastic drywall anchor. Concave rubber. Diameter: 2-7/16". Rigid doorstop protects interior walls from impact damage by shielding contact point of wall and door knob. Repairs damaged walls. With plastic drywall anchor. Concave rubber. Diameter: 2-7/16". Cushion door bumper, made of polyurethane material. Ideal to protect wall opposite door knobs. 1-3/4" x 3/4" x 5/8". Prevents additional, costly repair for wall damage. Covers minor damage and marks on walls. Air-cushioned action absorbs shock. Mounts to wall. Visual-pack. Stick adhesive-backed stop for use on clean and smooth surfaces. Covers minor damage and marks on wall. Protects wall opposite door knob. Mini-pack bagged. Designed to protect wall and door from damage. Design avoids contact with lock button. Large base offers easy, one-screw installation. Solid brass ring, rubber bumper and plastic wall anchor. Visual-pack. Designed to protect wall and door from damage. Design avoids contact with lock button. Large base offers easy, one-screw installation. Solid brass ring, rubber bumper and plastic wall anchor. Visual-pack. Designed to protect wall and door from damage. Design avoids contact with lock button. Large base offers easy, one-screw installation. Solid brass ring, rubber bumper and plastic wall anchor. Visual-pack. Concealed mounting. Mounting screw & toggler Included. 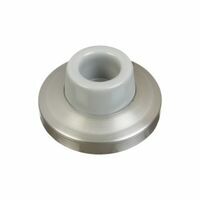 Wrought 2-1/2" diameter, 1-1/16" projection, Mounting screw & toggler included, -1/2" diameter, 1-1/6" projection. Prevents additional, costly repair for wall damage. Covers minor damage and marks on walls. Air-cushioned action absorbs shock. Mounts to wall. Visual-pack. National Hardware Rigid Door Stop, Series: V244, Magnetic, 3 in Height, Die-Cast, Satin Nickel, Includes: Mounting Screws, Used to Prevent Damage to a Wall Keeps doors fully open to prevent damage to the wall. Magnet hold the door open. 3" projection. Mounting screws included. Visual-pack. Keeps doors fully open to prevent damage to the wall. Magnet hold the door open. 3" projection. Mounting screws included. Visual-pack. Keeps doors fully open to prevent damage to the wall. Magnet hold the door open. 3" projection. Mounting screws included. Visual-pack.